The Warren County Records Center and Archives was dedicated in honor of the former Warren County Recorder, Edna L. Bowyer on June 22, 2001. We offer on-site records storage, records delivery, retention and disposition management, comprehensive records training, document imaging, and microfilming services to all county agencies. 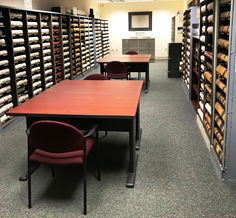 The Records Center has a storage capacity of over 20,000 cubic feet, while the Reading Room offers patrons an opportunity to research county records in hard copy, electronic, and microfilm forms. This allows the public a comprehensive research facility with immediate access to marriage, birth, death, estate records, Commissioner’s journals, Common Pleas and Probate Court indices, and a multitude of historic maps. Along with historical research, we offer educational outreach to K-12 schools within the county and offer a multitude of records and archival management training to localities in the area. The Imaging and Microfilm Division captures county-generated records in digital and analog formats to produce a high quality product in both electronic and microfilm media with the latest scanning and imaging technology. We specialize in wide format large scale imaging, high capacity multipage scanning and converting digital images for long term preservation in microfilm format. 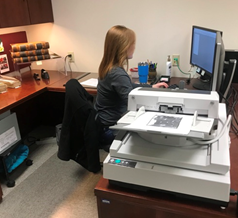 Governed by the Warren County Records Commission and by the Warren County Microfilm Board, respectively, we look forward to assisting patrons and county agencies with their records retention, archival or digital imaging needs.